So, I’ve tried every single way to cook brown rice. I’ve tried the basic stove top method, I’ve tried a rice cooker, slow cooker and I even recently tried the Instant Pot. But, the only way we absolutely love brown rice, is when I cook it in the oven. It comes out fluffy and perfect every single time. And, trust me when I tell you it’s easy. No worrying about burning the rice or too sticky rice or even under cooked rice. 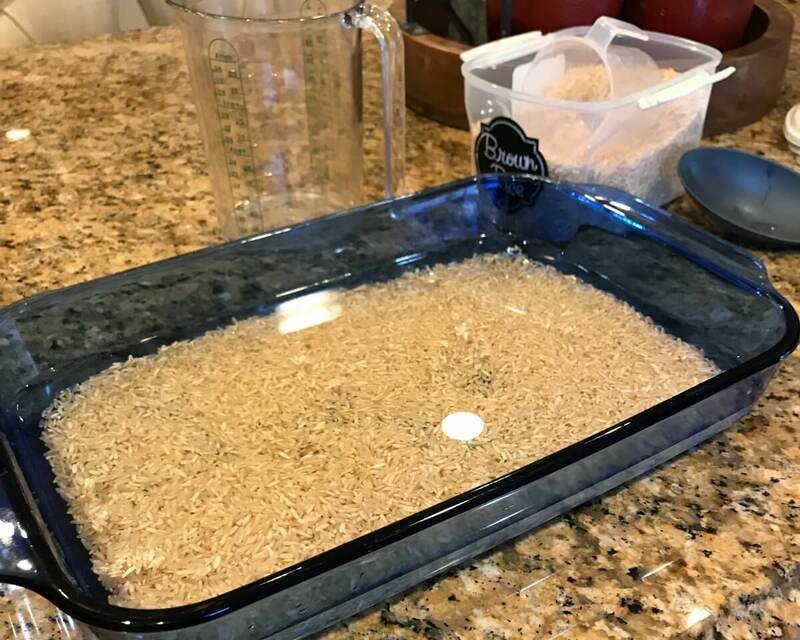 So, here is the step by step of this super easy method for cooking brown rice in the oven. 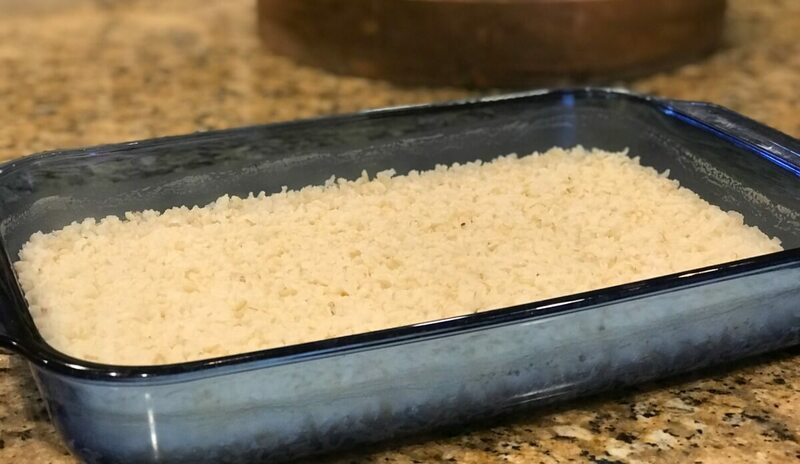 First, you’ll need a 9×13 baking dish and to set your oven to 350°. I like to use my pyrex pan but anything you have that size will work. Measure out 1 1/2 cups of brown rice and place in the pan. Use your hand or the back of a spoon and evenly distribute the rice at the bottom of the pan. Next add 3 1/3 cups liquid. I usually just use water but you can use broth or you can even combine the broth and the water. Then, with the back of your spoon, tap the rice until it all settles to the bottom of the pan. Again, make sure it’s all evenly distributed at the bottom of the pan. Then, tightly cover the pan with foil. I run my fingers around the edge to seal it tight. Cook in the oven, undisturbed for 1 hour. Note: Be careful when taking off the foil. 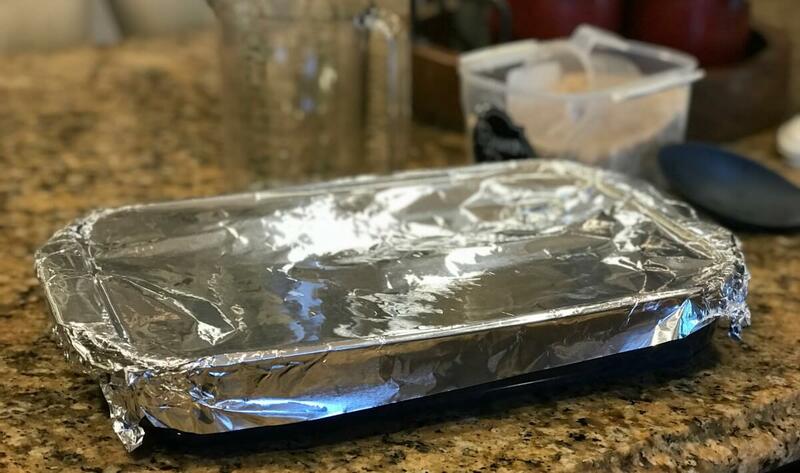 There will be a lot of steam released so either wait about 5 minutes or use a fork to pull off the foil. Cooking Brown Rice in the Oven is a fool proof method for perfect rice every time.